Right now this *HIGHLY RATED* Better Homes and Gardens New Junior Cook Book $11.55 (Retail $16.99). Make sure you clip the $1.08 coupon. Written and designed to appeal to kids ages 5 to 12, this all-new edition of the Better Homes and Gardens New Junior CookBook features 65 brand-new recipes that are simple to make and a blast to eat. Each recipe includes a photo of the dish and unique and lively illustrations of characters that tell a story to complement the dish. All the recipes here are easy-to-follow and packed with helpful hints and fun ways for kids to put their own spin on them. With lots of easy-to-understand nutrition information, it's a great way to teach kids about healthy eating while getting them interested in cooking. 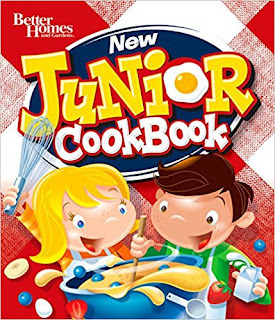 Teach your kids how to eat right and help out in the kitchen with the Better Homes and Gardens New Junior CookBook. It's the perfect way to make it rewarding for the whole family.